Student councillors Jayne Gliddon, Talia Day, Jamal Morrison and Charli Cambell-Warr. DWELLINGUP Primary School celebrated 10 years enrolled in Water Corporation’s Waterwise Schools Program at a recent special ceremony. As part of the program, teachers at the school have been educating students about the need to value, protect and conserve water resources for a decade. Water Corporation customer and community group general manager Catherine Ferrari said students were the water users of the future. “It’s important schools continue to educate students about the value of water in our drying climate,” she said. 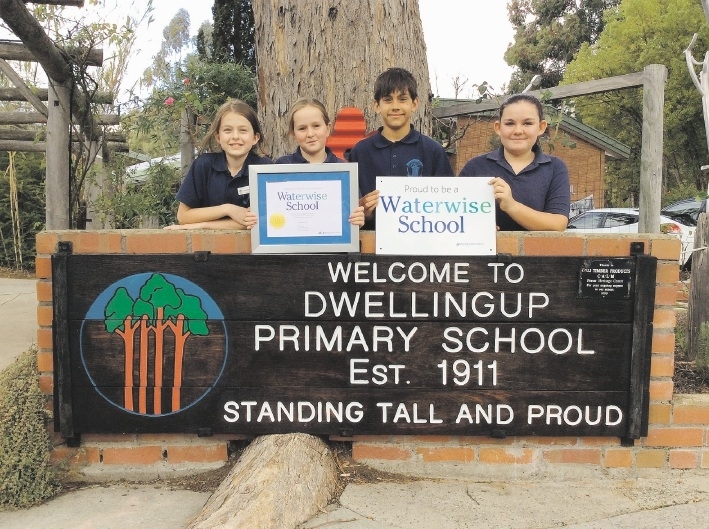 Dwellingup Primary School principal and school waterwise co-ordinator Colleen Sing said students participated in National Water Week in October and World Water Day in March. “We also have dual flush toilets throughout the school and water saving signs near the taps,” she said. For more information about the Waterwise Schools Program, visit watercorporation.com.au.